Every Glitch Wang Chung Tonight! Glitch just posted a ba-gillion stills (ok, several score) from Season 1 on their Facebook page. Party! 03:15. Justin Everett – Question for Scott (and Andy if applicable). What is your opinion on using a CMS like Joomla or Drupal for a website? 05:17. Douggie Sharpe. What is your favorite homemade sandwich, and favorite bought sandwich. 11:39. Thomas Brophy. What have been the best cosplays you’ve seen and one highlight from SpoCon? 15:16 Chris Piazzo. If you could switch up who played which characters in Dorkness Rising, how would you change them? What unique twist would each bring to the character? 17:22 Chris Piazzo. Of all the jobs on the set (which you've probably done a lot of them) which one would you like to learn more about or get better at? 18:04 Justin Everett. If you could have 1 prop from any movie, what would it be? 20:35. If you could have three superpowers or extra ordinary abilities, what would they be? 22:04. If you had to have one 4”x4” square on your body be itchy all the time where would it be? 22:35 – Brian Lewis calls in. 24:11 If you were to invent one law to be enacted across the country (or world) what would it be? 25:05 In your life story who would you pick to play yourself? Who would Quentin Tarantino chose to play them. 27:12 What is a movie that we can watch that makes you nostalgic. 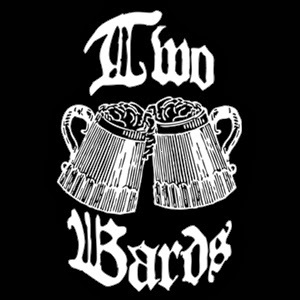 29:05 Why is it called Two Bards? 32:40. Any advice on how to keep talking like that? 33:58. How would you rate the podcast for commuting and driving? 36:31 Aside from scotch, what is your favorite con drink so far? 39:35. Do you have a go-to curse word? 42:30. Favorite funny filming moment? 48:11. What would be your most funny/absurd gaming moment? 51:30: Ever have a night at a con where a drinking bracelet leads to a hospital bracelet? 52:16: If you could be any non-Jedi Star Wars character which would it be? 53:32. Would you rather play several new characters or one continuous character? 3:55 – Espionage Cosmetics Kickstarter! As cinema/theatre professionals rather than as fans: What was it about Firefly, a series that was really just a Blade Runner/Sergio Leone mash-up, that caused it to inspire such continuing loyalty in its' fans and enter the popular culture, while other series that were cancelled at the same time, B 5- Crusade for example, have dropped from sight? 19:19 Moritz Schubert. What are some filmmaker's superstitions? 21:40 Mike Ott. What do you drink to remember and what do you drink to forget? 24:13 Mike Ott. What is your favorite movie in the last decade? 29:51 Mike Ott. What advice would you give to people who would want to follow in your footsteps? 32:09 Mike Ott. What would you tell your 12 year old self? 32:59 Mike Ott. If there was one film you could make regardless of cost, technology, etc, what would it be (remakes are also a viable answer)? 48:07 Fox Winter. 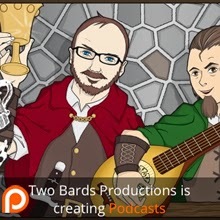 How many chords would the Two Bards score if the Two Bards could score chords? 48:38 Fox Winter. What is the theme of Frakkin' Epic or where could I find this information? People are asking, and I can't answer! 58:23. Seth sings Twinkle, Twinkle Little Star in Orcish.